New York shaggy rugs - A blend of hand-woven wool and viscose creates an extremely soft, heavy weight shaggy rug with a shimmering effect. New York rugs are a new style of shaggy rug. 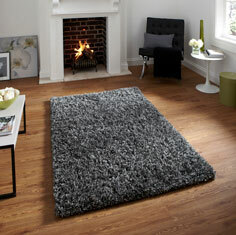 The viscose in the rug offers a metallic effect, the wool offers body and adds to the full, densely tufted pile. Made in five colours and three popular sizes.